None of us had ever thought that the study of Ancient Writing Systems would take us to Japan. Luckily, the Association for Written Language and Literacy gave us this opportunity. Robert and Natalia represented the CREWS project in the 11th Workshop in Writing Systems and Literacy, held by this association at the end of August at the Nanzan University in Nagoya, with the title “Writing Systems: Past, present (… and future?)”. Our colleague Anna Judson was there with us as well and she also has written a post about it, you can read it HERE. What did Cypriots and Iberians have in common? Did you know that Iberian and Cypriot scripts share the shapes of some signs? Although Iberian scripts do not really fall into the research of the CREWS project, they are fascinating and I couldn’t miss the opportunity to make them appear in our blog. In spite of the long distance between the Iberian peninsula and Cyprus, which were not directly connected in the 5th century BC (approximate date of the first written samples in Iberian), indeed, there are some signs both in Iberian and Cypriot scripts that have the same shape, but with different values. How was this possible? Iberian inscription on lead from Ullastret. The Bulwer tablet, with Cypriot syllabic writing. Trustees of the British Museum. We’ve talked before on this blog about the importance of hands-on experience with inscriptions. Seeing and handling the real thing gives a much clearer idea of the practical realities of reading and writing an ancient script than working from a transcription or even a drawing or photograph. So I was very lucky this week to be able to visit the British Museum with Cambridge’s Assyriologists, for a behind-the-scenes tour and a hands-on session with some of their many cuneiform tablets. For one reason or another, we’ve had a bit of a fantasy writing systems theme lately in our blogging. Not so long ago I wrote something about the various invented writing systems of the Legend of Zelda games, and Pippa has told us about Aurebesh, from the Star Wars series. Just one more for now. Since there’s a new Alien movie out, we thought it’d be nice to take a look at the influential ‘Semiotic Standard’ pictographic system developed for use in spaceship signage in Ridley Scott’s original 1979 film. 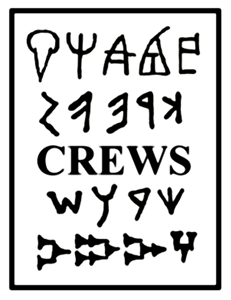 Last week the Faculty of Classics at the University of Cambridge played host to the CREWS Project’s first international conference, Understanding Relations Between Scripts II: Early Alphabets. This was a wonderful opportunity for us to bring together experts on ancient writing systems from around the world and discuss each other’s research. We’ve been doing a bit more outreach this week on the CREWS Project as Queen Elizabeth School, Barnet came to visit the Faculty of Classics. After a morning looking round the Museum of Classical Archaeology they joined us for a talk about writing in the ancient world. I kicked things off with a look at some of the different types of writing systems that exist and an introduction to Mesopotamian and Ugaritic varieties of cuneiform and the early history of the alphabet. This is a CD with songs to learn the alphabet and the sounds of the letters. Although this CD is meant to teach the English alphabet and I study the ancient Greek alphabet, it made me think about the different – or maybe similar – methods that modern and ancient cultures used to learn how to write. In Ancient Greece people would write on almost any kind of object. For example, votes to send a politician to exile for 10 years were written on pottery sherds! This practice of the Athenian democracy was called ostracism because the name for “sherds” in Ancient Greek is ὄστρακα (ostraka). Fragments of ceramic with votes for ostracism. Picture taken by the author: Agora Museum, Athens.